Q1. How to use tcpdump? Q2. How to make tcpdump exit after receiving set number of packets? Q3. How to make tcpdump display link-level header in output? Q4. How to make tcpdump display foreign IP addresses numerically? Q5. How to make tcpdump produce packet numbers in output? Q6. How to make tcpdump print shorter output? Q7. How to omit timestamp info from tcpdump output? Q8. How to make tcpdump produce detailed output? Everytime you open a webpage on your computer, data packets are sent and received on your network interface. Sometimes, analyzing these packets becomes important for many reasons. Thankfully, Linux offers a command line utility that dumps information related to these data packets in output. In this article, we will discuss the basics of the tool in question - tcpdump. But before we do that, it's worth mentioning that all examples here have been tested on an Ubuntu 18.04 LTS machine. minutes, seconds, and fractions of a second  since  midnight. it to read a list of saved packet files. In all cases, only packets that match expression will be processed by tcpdump. Following are some Q&A styled examples that should give you a better idea on how the tcpdump command works. Before using tcpdump to sniff data packets, you should ideally know which network interface you want the tool to work on. 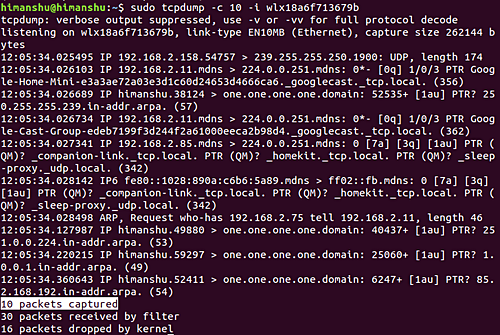 For a list of network interfaces available on the system, use the -D command line option with tcpdump. -i flag to specify an interface on which to capture. So you can see 10 packets were captured. So you can see that link level headers were produced in the output. This can be achieved using the -f command line option. To make tcpdump produce packet numbers in output, use the --number command line option. So you can see each line now begins with a number. Quick (quiet?) output. Print less protocol information so output lines are shorter. So you can see less information was produced in output this time. So you can see timestamp information (which is generally in the beginning of each line) isn't present in output now. packet integrity checks such as verifying the IP and ICMP header checksum. We've just scratched the surface here as the tcpdump command offers a lot of command line options. Once you are done practicing these, you can head to the tool's man page to learn more about it. please add section to filter on the output like src ip, dest ip, dest port at least to help make some good use of output. usually we open the saved file in some gui editor and work from there but if command line has the options would be nice to know else just show how to post process the output. Nice article. @Miten,tcpdump src <source_ip>tcpdump dst <destination_ip>tcpdump src port <source_port>tcpdump dst port <destination_port>Detailed tutorial: https://danielmiessler.com/study/tcpdump/I usually use tcpdump to capture network traffic on no-GUI Linux computers, but then copy file to my PC and make detailed analysis with Wireshark which supports tcpdump native capture format.